Christmas Eve. It’s arrived at last, suddenly, stealthily. What to do? Where to go? Tonight, for us, it’s definitely an ascent to the Grail Mountain, and the gleaming white former Passionist monastery, where a Teutonic maestro holds a musical academy of the highest quality and where midnight mass will be celebrated with the greatest compositional embellishments. 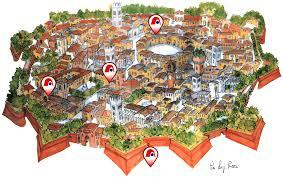 It’s also the last day for Lucca’s Christmas markets and, of course, for presents shopping. But today I think we’ll concentrate on preparing our Christmas repast as tomorrow morning we’ll be singing with our choir at Ghivizzano castello at 11.00 am High Mass. 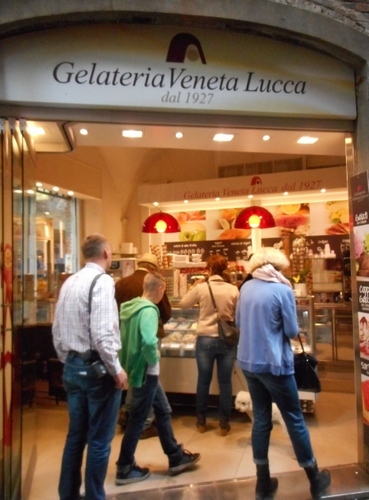 Also to do is organising the photographs of our recent trip to Vienna with the Lucca Philharmonic orchestra. If one’s got barely a day in the wondrous city of Vienna the best thing to do is not to see again those things one had visited on one’s one and only previous visit. 23 years ago we’d descended into the imperial vaults, admired Schonnbrunn palace and walked under the arches of Saint Stephen’s cathedral. This time we decided to visit new things. We took no. 1 tram to the Ring and crossed a park with the following features on our way to the Albertina. The Albertina holds one of the finest graphical collections of any world museum in a lusciously gracious baroque environment. 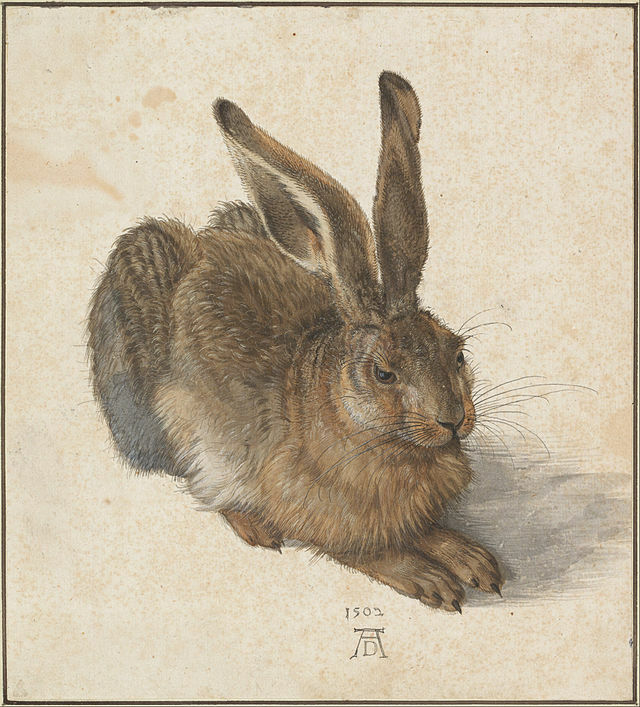 There are over a million prints and drawings stored including renowned drawings by Albert Durer. Who can’t remember seeing this hare before? Here is a design for Leonardo’s own last supper. But the Albertina is even more than this. The Batlinger bequest paintings, ranging from Monet to Picasso, have enriched the Albertina since 2008. Indeed, it’s one of the most important European collections of International Modernism. I couldn’t miss this as it wasn’t even there in 1991. 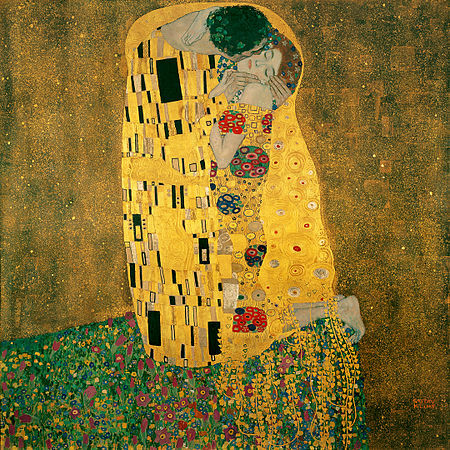 There are Impressionist and Post-Impressionist artists like Monet, Renoir, Degas, Cézanne, Toulouse-Lautrec and Signac. A further focus is on German Expressionism with the “Die Brücke” and “Der Blaue Reiter” artists groups, as well as outstanding works by Oskar Kokoschka, Rudolf Wacker and Herbert Boeckl. 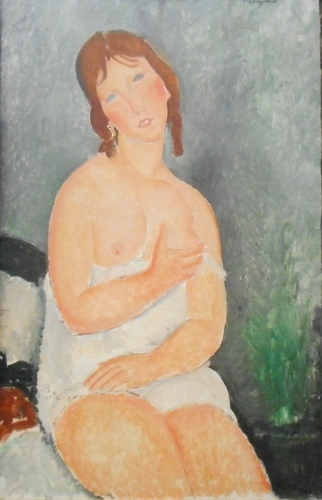 The Russian avant-garde, Suprematism, Constructivism and Neo-Primitivism with Chagall, Malevich, El Lissitzky, Exter, Rodchenko and Goncharova form the centrepiece of the collection. Concluding the exhibition is a whole roomful of Picassos. These were paintings that really hit the eye. 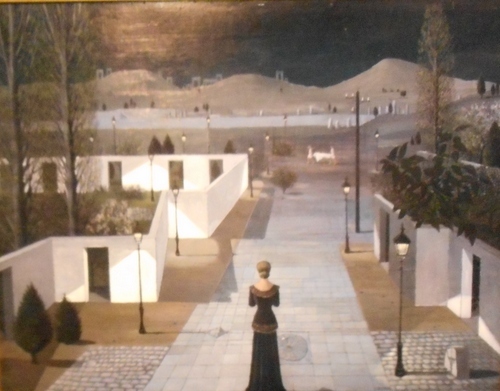 I was less impressed by the Miro exhibition in the same museum (apart from his early works) but then some are born to like this painter and others are not. The Albertina is lovingly presented and it is hard to visualise the severe damage this beautiful building was subject to in the last months of WWII. Fortunately, the actual collection was kept in safety and that is the important thing. 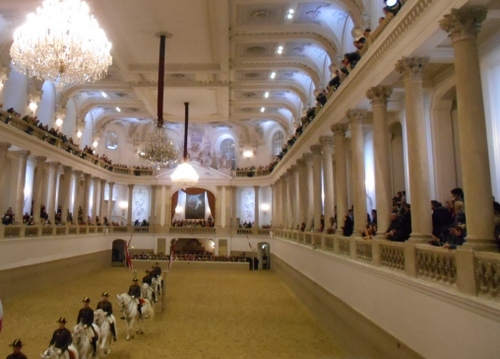 It’s a definate must-see if you are visiting Vienna. Twenty-fifty years ago, in 1989, the Berlin wall fell. For us it meant one thing – that, finally, we had the possibility of visiting freely all those place in Europe that had been out-of-bounds unless one was in an organized group. Here was truly touring freedom. It’s hard to realise today, when practically all these countries are now part of the European Union, just how hard travel restrictions were to some European destinations when the infamous wall was still standing. Our route took us first through Germany to Prague and for the next couple of weeks we travelled in what was once the dual crown of the great Austro-Hungarian Empire. 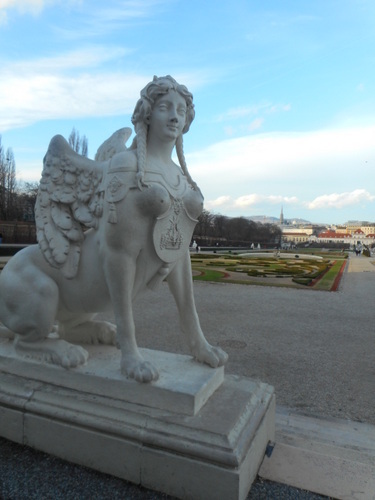 The cities of Prague, Budapest and the forests of Transylvania were all on our itinerary and, of course, Vienna. 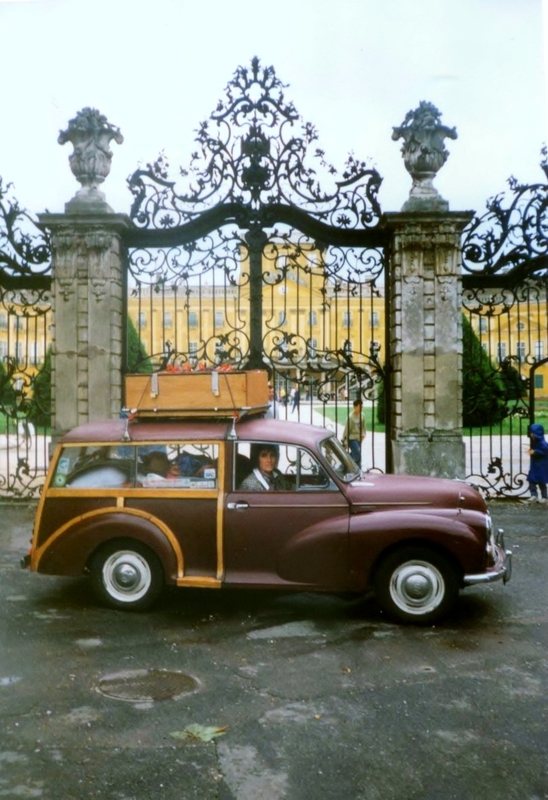 Our car, which is still with us, was a maroon Morris traveller – just the right car to use because of its relatively simple engine mechanics. 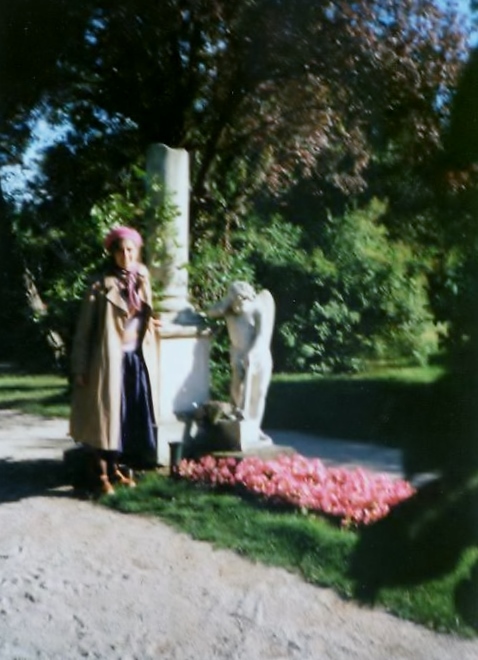 Here it is in front of the Esterhazy summer palace at Fertod in Hungary in 1991, the place where among many other works Haydn wrote his “farewell” symphony – a subtle hint that, at the end of summer, the musicians wanted to get away from this isolated spot and back to their homes and families near the winter palace. Visits to famous composers’ homes abounded on that trip and, especially in Vienna, we made it a point to visit as many of their dwellings as possible. 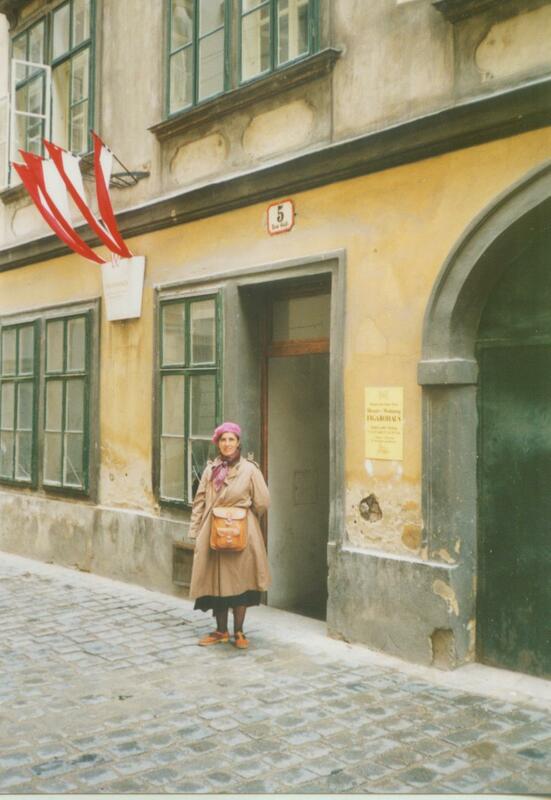 Here is a picture taken outside Mozart’s place near St Stephen’s cathedral in 1991, which also happened to be the two hundredth anniversary of his death. 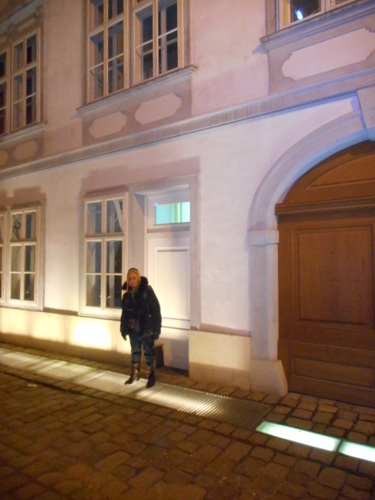 On this occasion we didn’t re-visit Mozart’s only remaining Viennese residence, where he lived from 1784 to 1787 and where he composed, among many other works, the Marriage of Figaro (indeed it was then called the Figarohaus – now it’s just plain Mozarthaus). It was after closing hours anyway. Back in 1991 we remember that it was just one apartment among several others grouped around a rather dilapidated courtyard with neighbours’ washing unembarassingly hung down from the windows. We have since learnt that under a refurbishment in 2004 the courtyard has been completely altered with the installation of a lift. Of course, this allows less able people to visit the house but I am sure that we would miss the much more “authentic” atmosphere of that old courtyard. Today the house from the outside looked much refurbished and rather clinical. 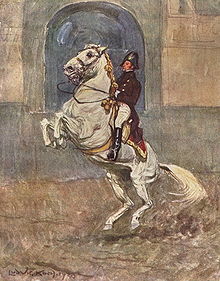 When young I never wanted to visit Vienna because I felt the city had actually contributed towards Mozart’s death by not properly realising his god-like talent. I have since discarded this simplistic view. There was, in fact, an epidemic at the time of Mozart’s last month and unfortunately, he caught the bug as well. As for Mozart’s near-destitution in his last year we can all reach that state if we spend more than we earn! Anyway, Mozart died on 5th December 1791 at the age of thirty five and, because of the fear of the epidemic spreading, he was given a quick burial in St Marx’s cemetery (which we remember as being near a motorway flyover). Again, digging through our archives of what was clearly the key trip in our lives, here is a picture of Mozart’s (presumed) grave in that cemetery. We live, anyway, through our works and Mozart will live as long as people are around with ears to hear and appreciate this musical God. 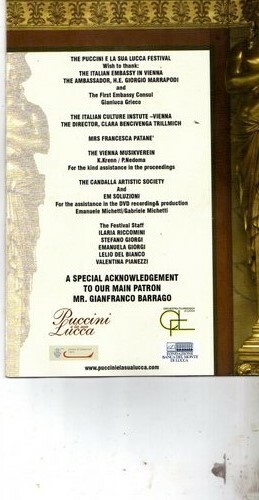 I, therefore, without hesitation, seized the chance of accompanying the Lucca Philharmonic Orchestra together with its choruses and soloists. Complimentary tickets were supplied thanks to the generosity of orchestra director and conductor, Lucca’s major musical energiser, entrepreneur and Puccini festival organizer, Andrea Colombini. At 5 am on 19th December, we set out from our little mountain village of Longoio to reach one of three coaches carrying a total of 200 musicians, of which 75 were orchestral players, technicians and assistants, to start the 560 miles from Lucca to the Austrian capital. Fourteen hours later we landed in south Vienna – it was clearly a long journey but certainly not a tedious one. 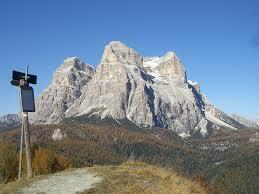 Scenically, the route was very varied and the company was most convivial. I’ve never known a fourteen-hour coach journey go so quickly! 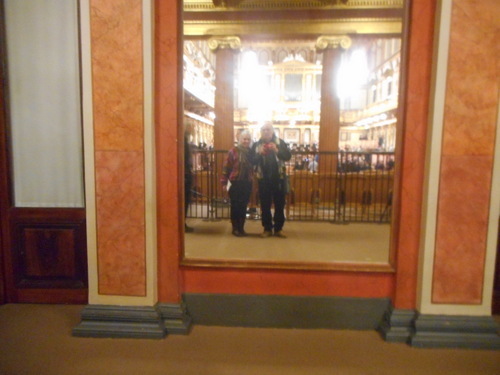 To attend a performance in the Musikverein is something I’d always dreamt of doing. To do so in the context of a concert by an orchestra I have praised as being a veritable asset to the city of Lucca is an added bonus as, indeed, was the very special occasion which prompted the orchestra to play at the Musikverein. Would the musicians from Lucca live up to the occasion again? Certainly! Not only did they do so but they exceeded all expectations. In the words of the director of the Italian Cultural Institute in Vienna Colombini’s Musicverein concert projected a positive and joyous image of Italy which could only increase confidence in the country’s talents. 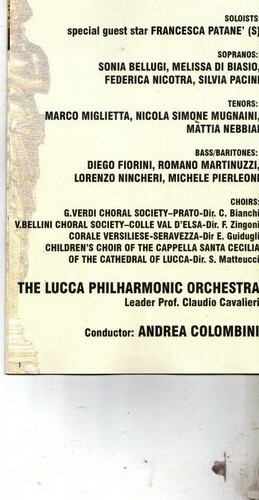 Verdi’s Sicilian vespers overture confirmed the stature of the Lucca orchestra from the very start. The sound was cohesive, well-balanced with a particularly impressive brass section. Of course, music lovers must know that the Musikverein golden hall has probably the finest acoustics of any concert hall in the world, due largely to its shoebox shape and the overwhelming use of wood in its interior. What seems marble is scagliolaed wood. Even the golden caryatids are of wood. This wood causes resonances in which one’s whole being seems to vibrate in tune with the harmonies produced. Truly, the Musikverein Goldener Saal (designed by Theophil Von Hansen and first opened in 1870) is a giant casket dedicated to the supreme aspirations of the greatest sounds ever produced outside heaven itself. The first vocal item from “Madama Butterfly” confirmed the high level of the singing which would permeate the whole event. It was a clever move to introduce “Italian” items into the program, here in the form of the aria from Richard Strauss’s “Der Rosenkavalier”. (I wonder if the orchestra will consider playing the same composer’s “Aus Italien” in their next visit to the former Hapsburg imperial capital?). The orchestra reaffirmed its mastery in the playing of “La Traviata’s” prelude from Act 1 – a most sensitive performance. Richard Strauss resumed with a melting performance of his song “Zuewignung”. The second half of the concert kicked off with the “Carmen” entr’acte played at a cracking pace which the orchestra showed it was able to fully sustain. 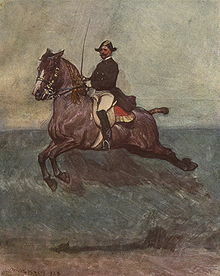 The ubiquitous toreador’s song concluded the French element of the concert. Perhaps the finest singing was sustained in Cavaradossi’s heart-rending aria from “Tosca”, “E Lucevan le stelle”, beautifully sung by Mugnaini. 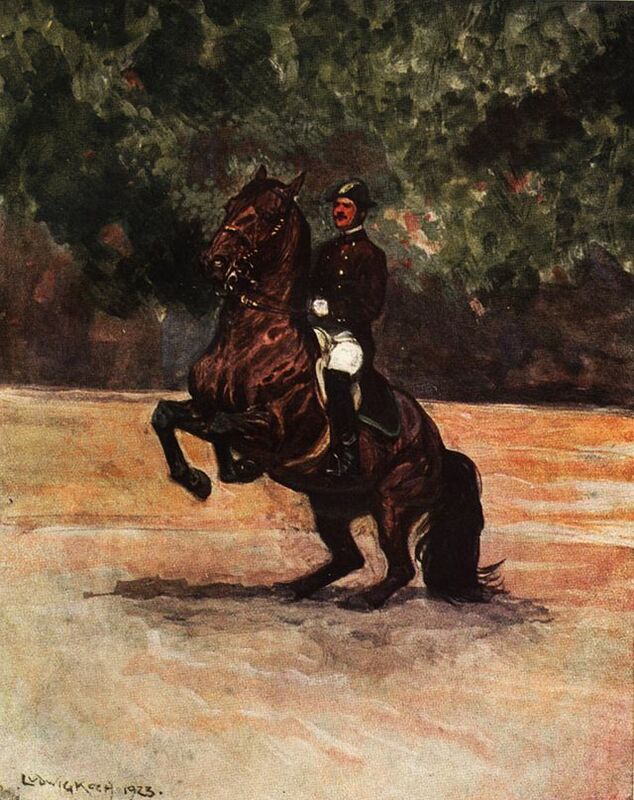 Pieces from those two lesser stars of Italian verismo, Mascagni and Leoncavallo, followed. There was a wonderful Mozartian interlude when rising star Sonia Bellugi sang with panache the immensely difficult Queen of the Night aria from Vienna’s greatest ex-resident of all time (and the world’s?) , Mozart. 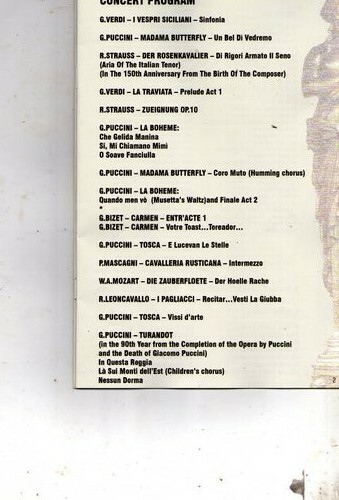 Mugnaini’s rendering of “Vesti la Giubba” had, by this stage in the evening, reduced us emotionally to pulp. The emotional high was sustained by “Vissi d’arte” and the official end of the programme concluded with the most celebrated items from “Turandot” including the reappearance of Lucca’s finest children’s chorus in the item “La Sui Monti dell ‘Est”. 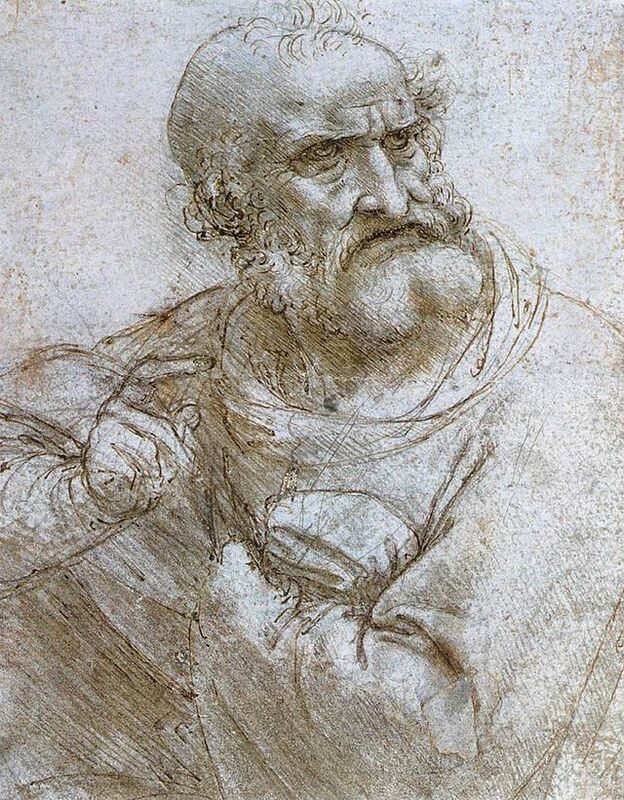 At this stage it would not be an exaggeration to state that several of the 1,800 members of the audience present were showing lachrymose symptoms. The music played hits at the heart and only the most sang-froid characters or robots could possibly remain unaffected. The audience clearly couldn’t face the streets of nighttime Vienna in this fragile state and the encore was appropriately “O Sole mio” in a highly inebriating interpretation with the entire soloists combining to raising our spirits again. Clapping was long, culminating not only in a standing ovation for the brilliant performers but also by that slow hand-clapping which signifies that the highest of the audience’s expectations had been reached and extensively overtaken. The combination of that wonderful golden palace of music, its sanctum sanctorum where the greatest composers have been played (and played) under the baton of the greatest conductors, Vienna’s Musikverein, so well-known from its New Year’s day concerts, together with the Christmas atmosphere and the energizing presence of prodigious and sonorous ambassadors from Italy, and particularily from Lucca, made us feel especially light-headed and happy at the end of this event which can only bring both praise and hope to an Italy struggling towards a cheerier future . When Andrea asked me how it went I had no difficulty in saying that he and his musicians had transported us all to seventh heaven. I’m still there now, thinking about that enchanted evening when Lucca swept Vienna off her feet. PS If you missed this wonderful concert do not despair – there will be a replica concert at Lucca’s Giglio on Tuesday 23rd December. 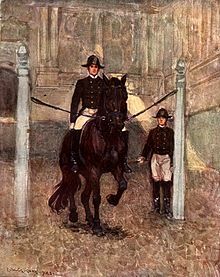 It was also filmed and the film will soon appear in cinemas. I’ll keep you posted when and where.